Are you are considering taking out a third party loan in order to equalize a trust or estate distribution and take advantage of California’s Proposition 58’s exclusion for Property Tax Reassessment? The act of doing so has saved some of our clients thousands of dollars annually and in most situations it makes sense to do so if you plan on keeping the home for more than just a few years. To make sure that the loan is financially beneficial, it is important to compare the costs of the loan with the expected property tax savings. At Commercial Loan Corporation we do not want to provide a loan to a client if it is not in their best interest and that is why we have created the Trust & Estate Loan Benefit Calculator. 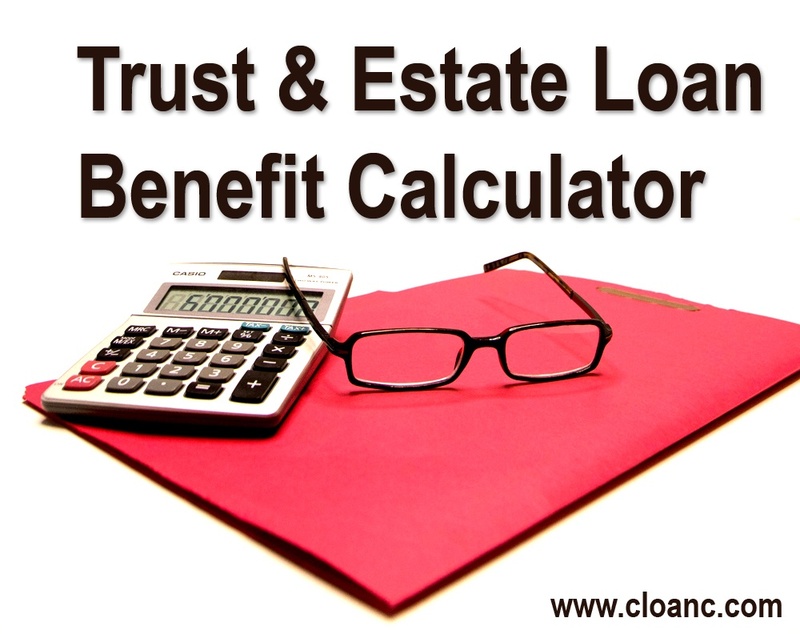 Our Trust & Estate Loan Benefit Calculator is free and easy to use. Click here to try it our for yourself. If you have any problems using the calculator, or have questions on trust or estate loans or would like to start the loan process, please call us at 877-464-1066. The Trust Loan Calculator is meant for estimation purposes only. When we speak with you, we will provide you with a detailed trust loan cost estimate and help you to determine you exact Proposition 58 property tax savings. Often times we are able to complete your trust loan process in under 10 days! When the time comes for the distribution of a family trust, often times one of the children-beneficiaries wants to hold on to real property held in the trust. Usually, the property can be transferred along with the Proposition 13 tax base. This can save several thousand dollars in property taxes. 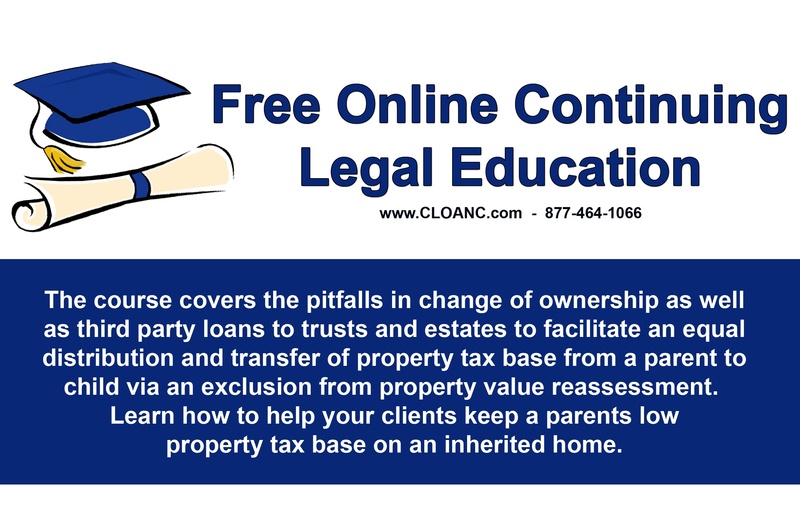 If the trust has multiple beneficiaries and there are enough liquid assets to make an even distribution, it is a relatively easy process to obtain the exclusion for reassessment by filing the proper paperwork with the county assessor (Form BOE-58-AH). What if the Trust is Illiquid?Keeping the exclusion for reassessment when transferring real property to a child-beneficiary can be trickier if there are not enough liquid assets in the trust to make an even distribution. The acquiring beneficiary may want to contribute personal funds to provide liquidity in the trust for an even distribution. This may not be a good idea. The Board of Equalization (BOE) may view this as a sibling buying out the interests of another sibling(s) as opposed to a parent to child transfer. The BOE may reassess the property in this situation. So what do we do? I am glad you asked me that. The BOE allows the trust to borrow from a 3rd party (not one of the beneficiaries) to provide liquidity. The loan must be to the trust without a personal guarantee by the acquiring beneficiary. The BOE may view a loan with a personal guarantee by the acquiring beneficiary the same way it views a contribution of capital to the trust by the acquiring beneficiary. do not like to lend to trusts and their Deeds of Trust are written with alienation clauses. That means when title to a property changes, the lender can call the loan due. When a trust is distributed, the title to the property will change from the trust to the acquiring beneficiary and the alienation clause would be triggered. Another option is private money lenders (hard money). These are lenders that have investors, usually individuals, willing to lend their money for a certain rate of return. These individual investors frequently have a requirement that at least 90 days of interest be paid. Some private money lenders charge a prepayment penalty to insure their investors receive 90 days of interest. Private money lenders will typically charge 2 to 3 points on top of the interest rate. This can get expensive. Finding a family friend or relative that is not a beneficiary and is willing to lend money to the trust may be the best option (least expensive). Unfortunately, this may be just as difficult as finding a conventional lender willing to lend to a trust. Commercial Loan Corporation will make these 3rd Party Loans? There are not many companies doing these loans currently (October 2017). 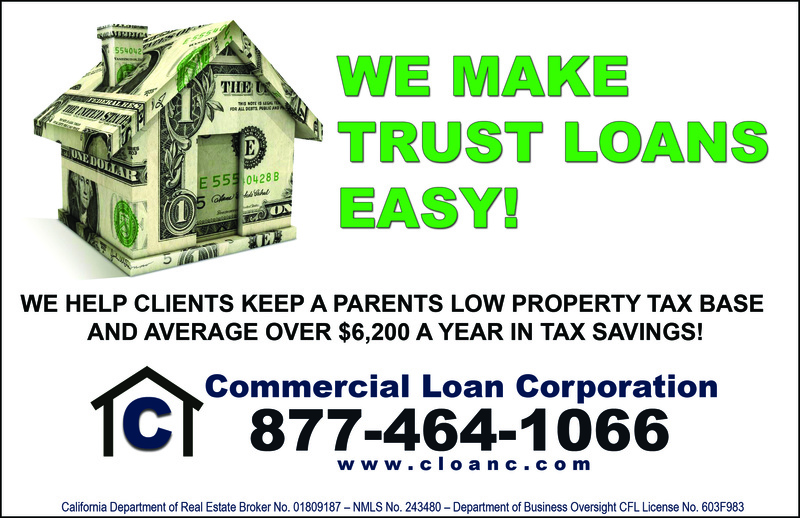 Commercial Loan Corporation in Newport Beach, California is actively lending to trusts. We do not charge prepayment penalties, so loans can be repaid quickly to avoid paying above market interest rates. These loans are not cheap and we provide a cost/benefit calculator on our website. It is important to determine how much one will save in property taxes each year versus the loan costs. 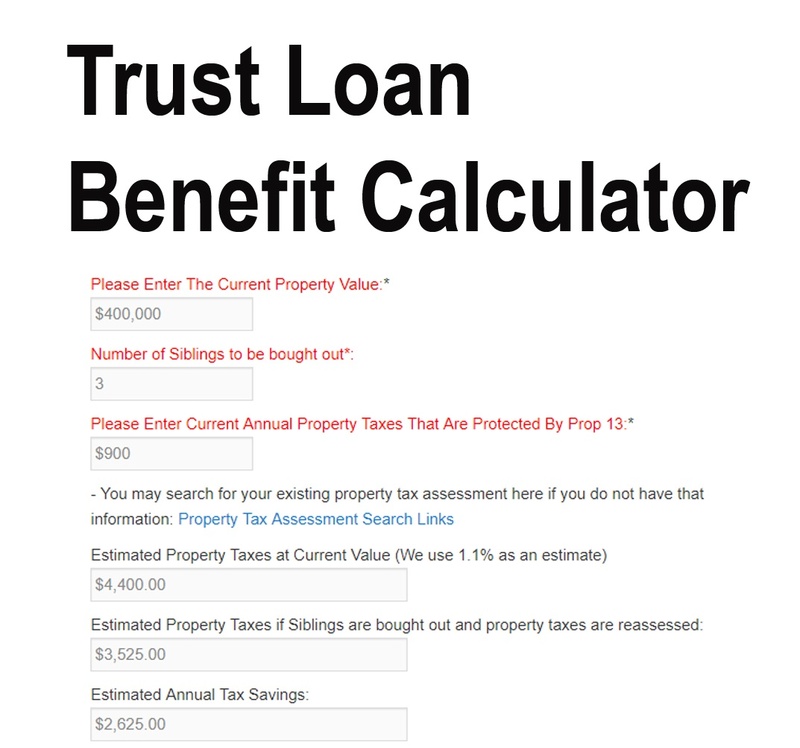 The calculator will show how many years it would take to recoup all of the loan costs with property tax savings. If the property will not be held long enough to recoup all of the loan costs, it does not make sense to get a 3rd party loan. In most circumstances the property will be held much longer than the break-even point and the property tax savings will be a great benefit. What are Commercial Loan Corporation’s Lending Criteria? Property must be non-owner occupied. Preferred loan amount does not exceed 65% of the property’s appraised value (Exceptions have been made for high credit score borrowers with liquid assets greater than the loan amount). There is a plan for repayment by refinance or verified liquid assets (If refinancing, an approval letter is needed from an approved conventional lender). Loans are recorded in the 1stlien position (Loans in the 2nd position are considered on a case-by-case basis). Appraisals completed for the trust may be acceptable with a review by a third party appraiser chosen by Commercial Loan Corporation.